and actually I really like this early one too. One NO.5 battery for praviding the power, enabling to automatically beckon the hand for months, setting it at any position, never be offected by the lights. Inside attaching poly luck-beckoning lyrics, sticking them for immediate realizations. Day 6, December 29, was our last full day in Puerto Rico. It started off with an early morning wake-up in The Great Escape, appropriately to make our Great Escape from the place. The method: light aircraft. Very light aircraft, in fact: so light that they arranged the seating according to the passengers' weight, to balance the plane. After landing back in San Juan we took a cab into Old San Juan to see what it's all about. Very nice, is what! Narrow cobbled streets and lots of colors; very colonial and very cool. We saw San Francisco, too. Photos from the day are available online. We woke up early on December 27 so we could wave goodbye to the evil resort and get a cab to Fajardo, where we'd catch a ferry to Vieques. The rest of the photos are also available online. More photos from Boxing Day in Puerto Rico are now online. 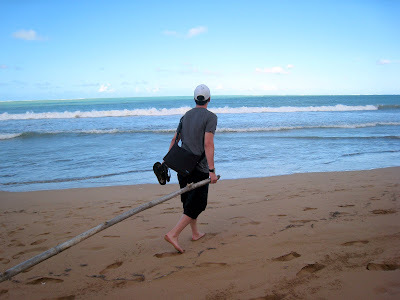 We woke up on Christmas day in San Juan and went out for a walk on the beach. Beautiful! Warm! Sunny! Sandy! Not things one typically associates with Christmas if one's from England but Puerto Rico has a way of being different. At lunchtime we hopped in a cab to Rio Grande, where we'd booked into the "Rio Mar Resort and Spa by Wyndham" on priceline.com (ie. we'd named our price and it had put us there). The room was super but I'm not sure a resort was really what we were looking for; lesson learned. Photos from Christmas Day 2007 available online; boxing day to follow. We stayed the first night at the curiously named "At Wind Chimes Inn" (yes, the opening preposition is part of the name). The room was small but comfortable; the noise terrific but after our long journey not enough to disturb our sleep too much. And hey, we were a block from a lovely beach in Condado, San Juan, Puerto Rico.